Instead of splashing pattern across an entire piece, reserve the motif for a particular section, such as the center drawers of a buffet. In addition to pattern panache, this thrift store dresser was made new with a fresh coat of white paint on the frame and new dark walnut stain on the drawer fronts. 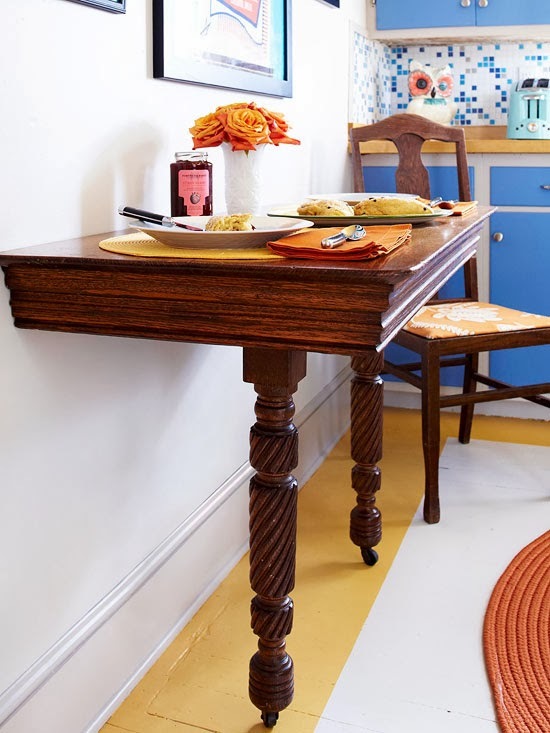 Give a dining room table new life by cutting down the base to coffee table height. 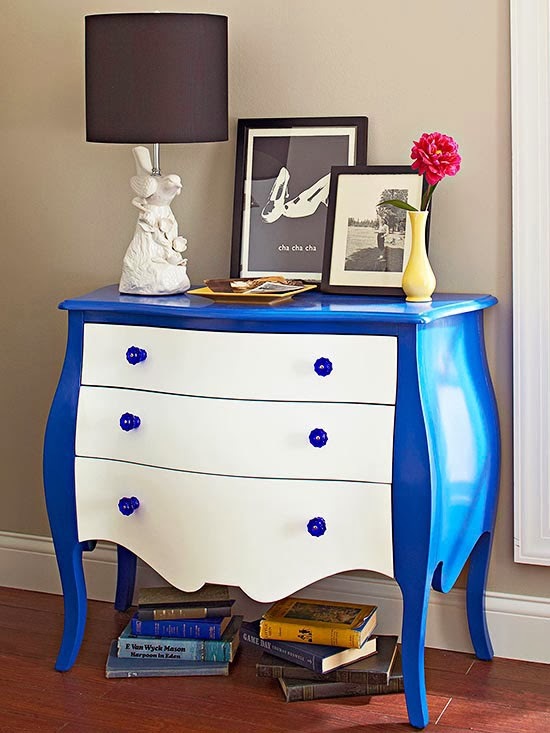 Blue paint refreshes the finish while oversize nailhead trim embellishes the apron of the table. Give a desk or dresser an ombre effect. 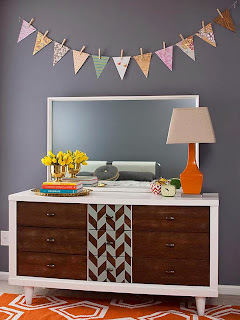 Pick a paint strip in a color you love and buy a can of paint for each drawer or "tier" of drawers. Use the lightest color on the strip for the top, the next darkest color (or colors, depending on how many drawers you have) for the middle section, and use the darkest color for the bottom drawer. Make sure to use colors in the order that they are displayed on the strip so you get a natural progression of color. Give a basic round table a unique angle with old-fashioned wood clothespins. 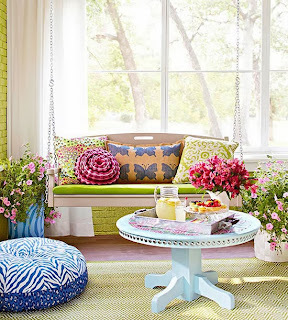 Paint the table in your desired color and paint the clothespins the same color. To attach the clothespin, dab wood glue on the back of each clothespin and press against the table's edge. Then nail into place at its chubbiest part, using a pneumatic pin nailer. For level pin alignment, place a 1/2-inch-thick board on the tabletop as a guide. 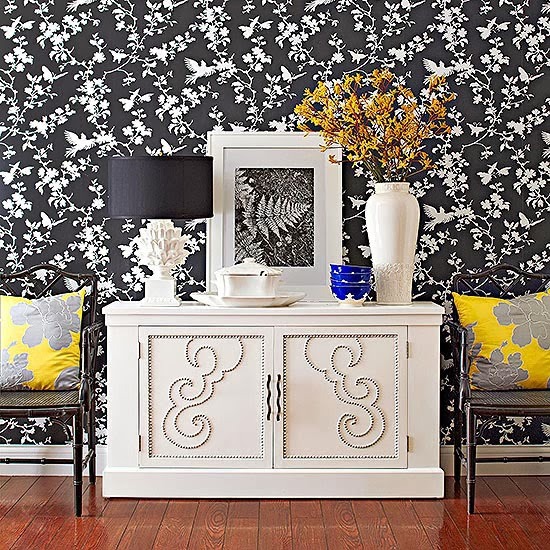 Think beyond paint for furniture makeovers. Add nailhead trim to flat surfaces. 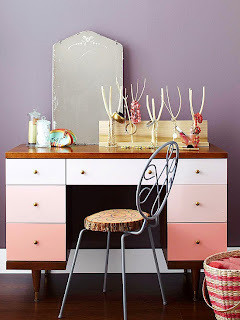 Instead of drilling or hammering nailheads, use a faux stand-in, such as metallic spray-painted round wood plugs. 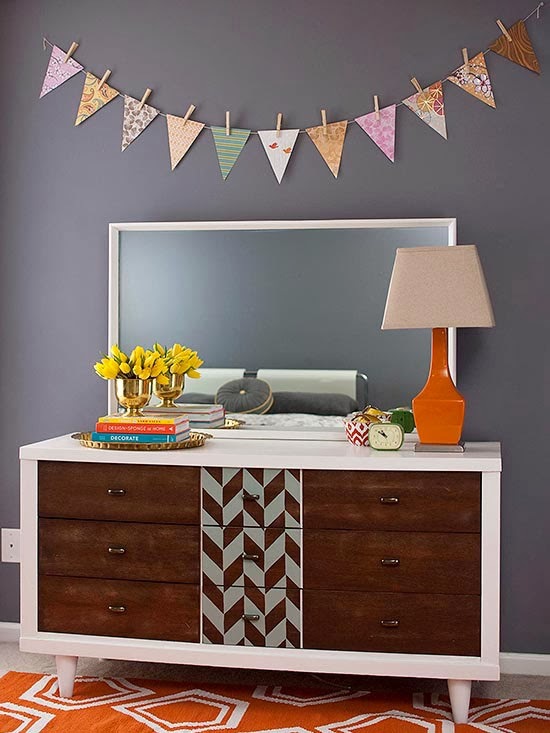 Use the trim to outline door panels or create designs. 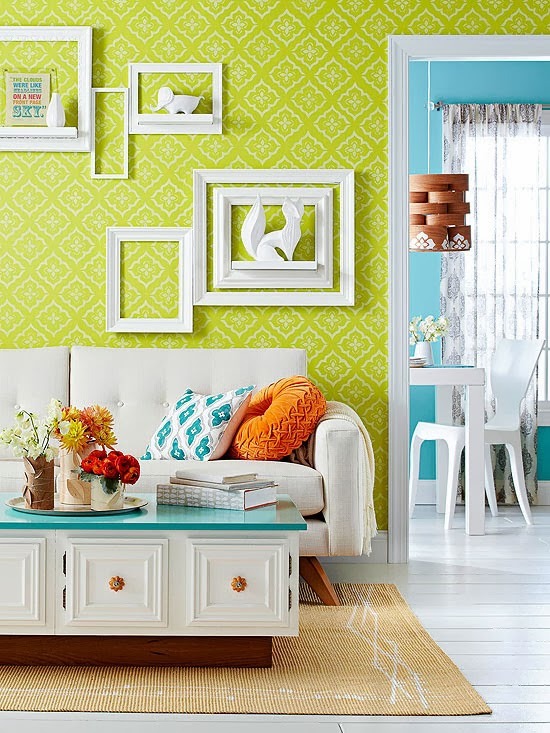 Why stick with just one paint color? The bowfront dresser's glossy blue frame stands in contrast with the white drawer fronts. Try mixing paint finishes, too. Even though the difference is slight, the shift from semigloss to gloss can create an even more customized look. 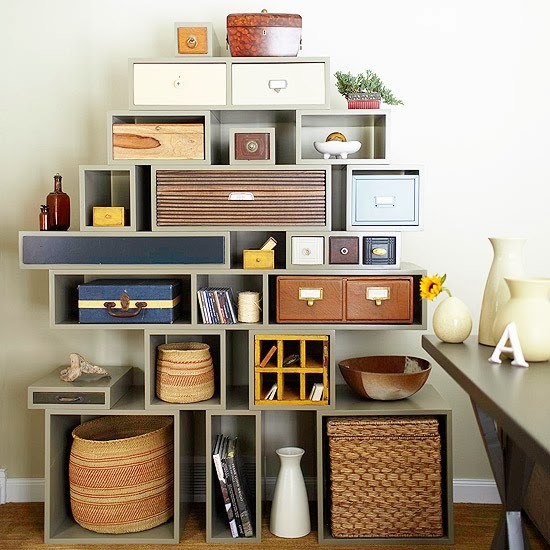 Skip the basic bookcase and construct your own. 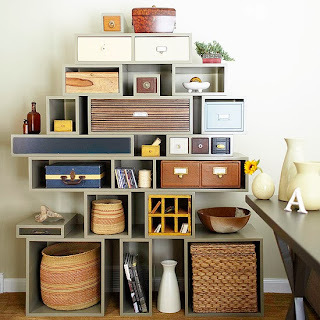 Arrange a series of boxes in different sizes, stack, and attach. Create a coffee table from two retired kitchen cabinets. Place the cabinets side by side, screw together, and paint white. Cut a piece of medium-density fiberboard (MDF) to fit on top of the cabinets. Paint and coat the piece in polyurethane, then attach to the top of the cabinets. For the base, cut the number of MDF sheets to size and stack depending on the desired height for the table. Glue the sheets together. Face the base with veneer and screw to the bottom of the cabinet. 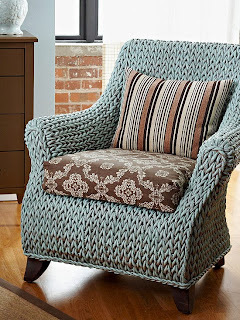 Paint a wicker chair to give it a fresh update and to bring it up to speed with the rest of your decor. Use a liquid deglosser before painting for best results. Even a dilapidated table can be revived with a bit of creativity and ingenuity. Shop for a table that is past its prime (this one was missing a leaf). You'll also need a 2x2-inch board, wood screws, a table saw, and a drill. Take all of the hardware beneath the table off (sliding mechanisms, etc.) Cut the table in half lengthwise with the saw. Cut the board to 1 inch less than the width of the table. Attach the board with screws to wall studs at a height flush with the underside of the table. Fasten the table to the board from underneath with wood screws. 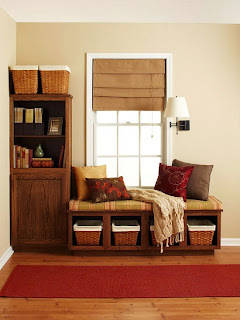 Another purpose for old or unfinished cabinets: a window seat with the look of a built-in. Build this project in an entry or living room for extra seating and storage.